Dermatopoietin® | EVENSWISS®: a leader of signalling cosmetics. New age in anti-aging beauty care! Figure. A principle of EVENSWISS® signalling: Dermatopoietin®/DP® is a core component of EVENSWISS® cosmetics. It does not penetrate the skin. Instead of this, DP® sends a signal from a skin’s surface to the skin depth and begins production of collagen and elastin in the dermis. The effect is visible on images of aged skin at before (Baseline) and one month after Dermatopoietin® (DP®) applications. Method: two-photon laser fluorescent microscopy. Red fibers – collagen, green fibers – elastin. EVENSWISS® offers a revolutionary approach to skin care: the signalling cosmetics. Conventional cosmetics are not so effective because our skin serves as an impenetrable barrier for substances outside of organism. It is a reason why cosmetic ingredients even being effective in principle have no chance to reach the deep skin layers. It is also the reason why penetration enhancers, liposomes, nanosomes, microneedles, and other technologies directed to weakening or destroying the epidermal barrier are so popular in the modern cosmetics. However, there is an effective alternative to the physical delivery of cosmetic ingredients to the skin depth. Scientists know that skin cells communicate with each other and when one cell releases a signal, other cells respond to it. 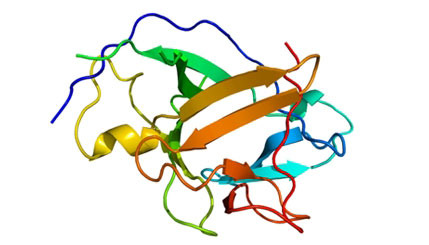 Interleukin-1 alpha (IL1-α) is a specific signal produced by cells of epidermal barrier. This signal is unique: it may be delivered over long distance, from skin’s surface across all epidermal layers to specific target cells (fibroblasts) in the dermis. Once dermal fibroblasts receive such signal, they begin production of all valuable skin components: collagen, elastin, and hyaluronic acid. The interleukin-1 alpha signalling across epidermal barrier provides a basis for unique “signalling cosmetics” based on delivery of a signal, instead of a substance, to the depth of the skin. Note, there is no longer need in physical delivery of cosmetic ingredients to the skin depth. Signalling cosmetics delivers a signal, but not a cosmetic ingredient per se, to the skin depth to begin a skin renovation program. EVENSWISS® mode of action: Dermatopoietin® (DP®) is an innovative peptide complex and is the principal component of Swiss cosmetic brand EVENSWISS®. Dermatopoietin® formula does not penetrate the skin. 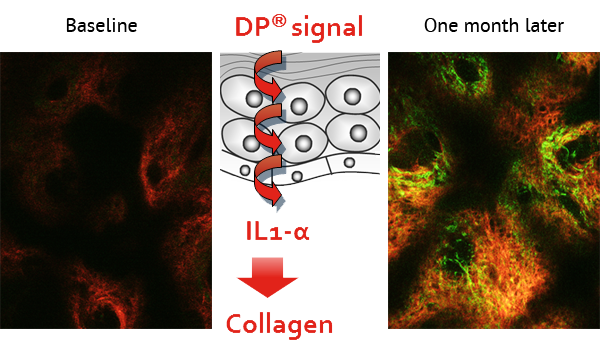 Instead of this, Dermatopoietin acts on receptors on skin’s surface to send an interleukin-1 alpha signal across all the epidermal barrier to the skin depth to begging collagen and elastin replenishment in the dermis (see on Figure). Dermatopoietin® is effective as a fast collagen booster for aged skin. The results are clinically proven and visible. All EVENSWISS® products contain the unique and patented Dermatopoietin® peptide complex. Using the skin-care products of the EVENSWISS® line, you boost the collagen in your skin and achieve great skin appearance. Efficacy of EVENSWISS® with Dermatopoietin® is based on the properties of the unique skin native cytokine: Interleukin-1 alpha (IL1a). IL1a is continuously produced by healthy human skin where it acts as biochemical messenger between cells to activate the natural repair process of skin, restore the skin barrier function and regulate the hair cycle. With age, the production of IL1a in skin declines which leads to disturbed skin and hair renewal processes with the associated signs of skin aging. Dermatopoietin®, the unique active ingredient of EVENSWISS®, restores the optimum level of IL1a and thereby revives the production of collagen, elastin and several growth factors which are essential for the regeneration of skin. Dermatopoietin® is our trade name for interleukin-1 alpha (IL1a). This cytokine, which is a major regulator of the immune response, plays also an important role for skin homeostasis (renewal). The epidermis, especially the stratum corneum, is the human tissue with the highest content of IL1a. IL1a is constitutively expressed by keratinocytes, subject to positive feedback control (IL1a stimulates the expression and release of IL1a, see Efficacy Studies (Study 1). Topical application of Dermatopoietin®, which is too large a molecule to penetrate skin, results thus in the release of endogenous IL1a by making contact with the first layer of living skin cells. Due to stimulation of adjacent cells this results in a ‘wave’ of IL1a which penetrates the epidermis and eventually reaches the dermis. Dermatopoietin® affects thus deep skin structures without itself penetrating skin by triggering a cascade of reactions which propagates from the surface to the depth of skin. IL1a has been shown to stimulate dermal fibroblasts to produce a.o. collagen and elastin, two major building blocks of the skin's connective tissue, and to release several growth and differentiation factors, which act on the epidermis promoting its regeneration. For human pharmacological data on the stimulation of collagen and elastin deposition and the strengthening of the epidermis by Dermatopoietin® see Efficacy Studies (Study 2, 3 and 4). Dermatopoietin® is always used in combination with Hexadeltine®. These two compounds are referred to as Dermatopoietin® Peptide Complex. Hexadeltine® is a Leu-enkephalin analogue (delta-opioid) with the structure Tyr – D-Ala – Gly – Phe – Leu – Asp. It prevents excessive release of IL1a from keratinocytes (see Efficacy Studies - Study 1). Delta-opioids have in addition anti-inflammatory properties; they potentiate growth factors and stimulate capillary blood flow.